Martingale dog collars are also known as limited slip dog collars and are the ultimate solutions for a no-slip dog collar. They are great for dogs whose heads are smaller than their necks, like greyhounds, whippets, pugs, Wheaton terriers, and Jack Russell terriers. 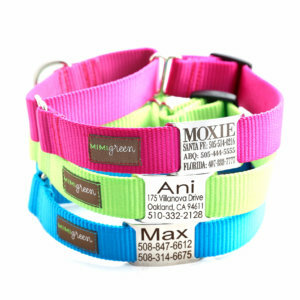 Every one of our Mimi Green designer dog collars can be made into a martingale dog collar collar. 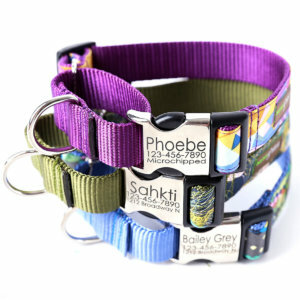 We even make personalized martingale collars with buckles and nameplates! Looking for really cool Martingale Collars or Limited Slip Dog Collars? We’ve got em! “What does Martingale mean?”, you ask? Loosen the collar diameter with the tri-glide, and slide the collar around your dog’s neck. Tighten it up with the tri-glide to the correct size. Attach your leash to the collar’s dee ring. When the dog pulls, the loop up front on the collar will tighten so your dog cannot escape their collar. When adjusted correctly the dog is never choked, but the collar stays snug around the dog’s neck until the pressure is released. Martingale is the ultimate solutions if you are looking for a no-slip dog collar. 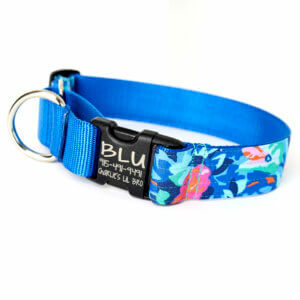 We pride ourselves in making super stylish, cool martingales for your pup! Our Engraved Martingale collars come with a quick release buckle, which makes removal super easy! And their important information is engraved right on the buckle! NOTE: Only our engraved buckle martingales come with a buckle. All of our other martingale collars are buckle-less.